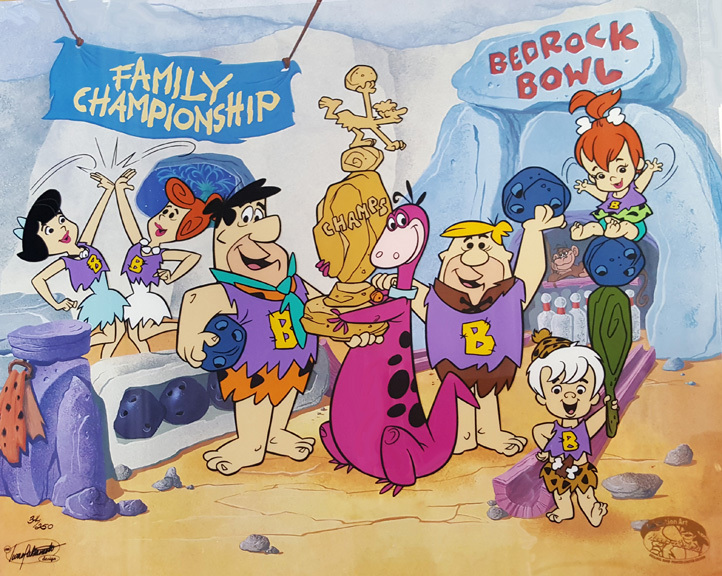 “Yabba-Dabba-Doo!” In this limited edition cel, Fred, Wilma, Pebbles, and Dino join Barney, Betty and Bamm-Bamm Rubble to celebrate their victory in Bedrock Bowl's Family Championship. “Twinkletoes” Flintstone leads the team to victory, but the whole gang is definitely in A League of Their Own! This cel began with a drawing from Iwao Takamoto. A master inking by Helene Hunter was silk-screened, along with the Hanna-Barbera and Iwao Takamoto design seals onto an acetate sheet (or “cel”). Each cel was then expertly hand-painted on the reverse side using traditional Hanna-Barbera colors. The background layout drawing was also drawn by Iwao Takamoto and brought into living color by talented longtime Hanna-Barbera artist Ruben Chavez. In the final step of production, the edition number was hand-inked on each cel.